Kangaroos box with their forelegs. A female kangaroo carries its young in its pouch. A young kangaroo remains attached to its mother even after leaving the pouch. If possible, kangaroos will run fro danger rather than fight. Kangaroo mothers can carry more than one baby in their pouch at a time. 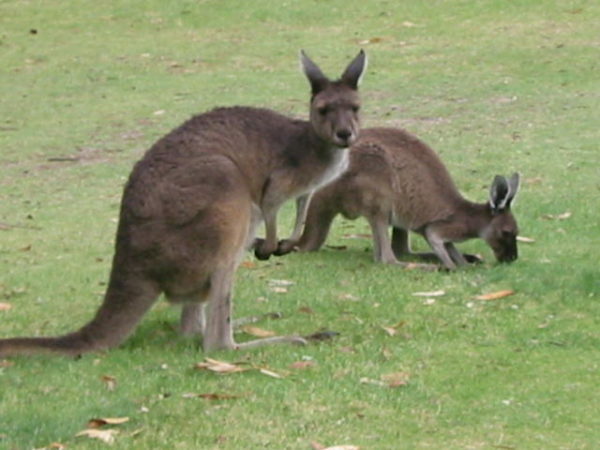 Kangaroo mothers can stop an embryo’s growth for as long as is needed. Kangaroos normally live in very dry areas. Only male kangaroos fight among themselves. The feet of kangaroos are powerful weapons for self-defense. The kangaroo is loved by people world wide. The leader of a group of kangaroos is a male. The pouch of the female is one of the most interesting feature of the kangaroo. A kangaroo leans back on its heavy tail and uses its rear feet to kick its enemy.